George Fiorini wants to shake things up at Element. "I finally feel like I have an opportunity to make my mark on St. Louis." George Fiorini has had many "aha!" moments in his bartending career, but the one that really sticks with him came courtesy of his first shift with talented St. Louis barman Tony Saputo. Saputo's advice would come to define Fiorini's bartending philosophy. "I'll never forget it. I was so excited and nervous for my first shift at Layla, and I went running up to the bar, trying to get behind it," Fiorini recalls. "Before I could, Tony slammed his tree trunk of an arm down on the bar and stopped me. He said, 'Before you work here, you need to know a few things. You're going to be learning a lot of crazy things and ingredients, but if someone wants a vodka Red Bull, you are going to give them the best vodka Red Bull they've ever had.'" 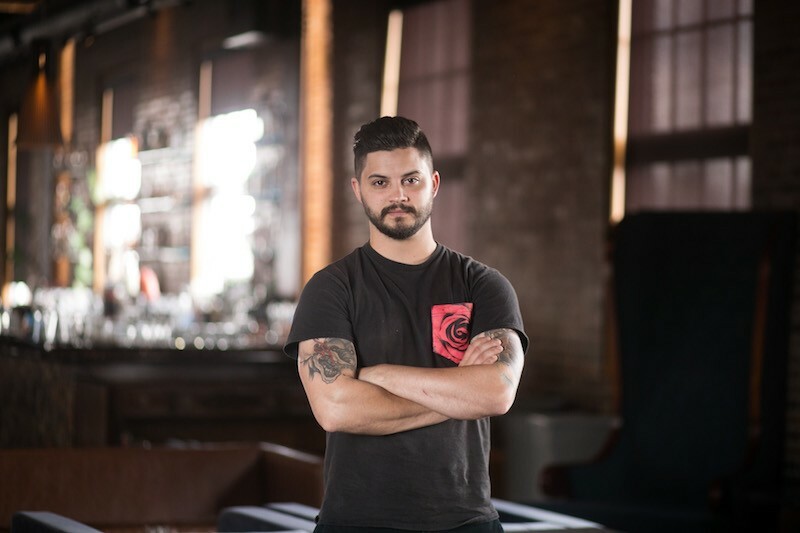 Now the newly minted bar manager at Element Restaurant and Lounge (1419 Carroll Street, 314-241-1674), Fiorini says it wasn't all that long ago that he was an aspiring bartender trying to find his way. He was drawn to hospitality at an early age, working at jobs including the Golden Corral and Taco Bell as a teenager before moving on to the acclaimed Bogart's Smokehouse. There, he worked the cash register for three years, absorbing the way that owner Skip Steele interacted with his guests, greeting customers at the door every day with a smile on his face. Fiorini committed, then and there, to learning his regulars' orders, memorizing names and engaging with them in a meaningful way, even if they were just passing through for a simple barbecue plate. That experience stayed with Fiorini as he went on to wait tables at the Old Rock House and then Atomic Cowboy. Though he admits he didn't know how to pronounce Herradura, or even anejo, he called upon the hospitality skills he learned at Bogart's to make up for his lack of spirits knowledge. His demeanor and keen eye for hospitality made an impression on Saputo, who took Fiorini under his wing. Fiorini worked with Saputo at Layla for just four months, but during that time he learned enough to build a strong cocktail foundation, even if he didn't take it all that seriously at the time. "I had been there for two months, and someone ordered a negroni," Fiorini laughs. "I had no idea how to make it, so I yelled across the bar to Tony. Needless to say, he blew up." Fiorini left Layla to move to Albany to be with his then-girlfriend. He found himself new to town, in the middle of the city's worst blizzard in years, and in need of a job. He got one at a local restaurant and further developed his bartending skills. However, his real education began after his shift when he would head to the city's best cocktail bar, Speakeasy, to soak up knowledge from the impressive bar staff. Eventually, they hired him. Fiorini honed his cocktail chops at Speakeasy before leaving to open a new concept. Called Savoy Taproom, the new spot represented everything that Fiorini thought a bar should be. "We were told by everyone that it wouldn't work because the perception was that cocktails were pretentious," Fiorini explains. 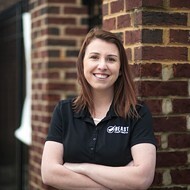 "But we ended up becoming one of the busiest bars in the region, and more important to me, we were super diverse. Everyone felt welcome there. It was fun and felt like home for people." Fiorini would have stayed in Albany, but when Saputo came calling with an opportunity to help him open the Benevolent King, he jumped at the chance to reunite with his mentor. As Saputo's right-hand man, Fiorini had a front-row seat for the innovative libations being developed for Ben Poremba's Maplewood hotspot. He reveled in the opportunity to be Saputo's taster. However, something told him that it wasn't where he was meant to be. "On the one hand, I moved back to be humbled by Tony, and it was a blast. I cut my chops even more and learned a ton about food and service there," Fiorini explains. "However, once I got there, I realized it just wasn't the right fit for me or my style. The Benevolent King is more geared toward a restaurant style of service, but I am more comfortable at a bartender's bar where I get to hang out and entertain." Fiorini would get that opportunity when the chef and general manager of Element reached out. The restaurant and bar was trying to begin a new chapter, and they offered Fiorini a blank canvas on which to execute his vision of what he believes a bar should be. It was an offer he couldn't refuse. "They told me, 'If you have an idea and you want to do it, don't be scared of failure. Just do it,'" Fiorini says. "To be able to try out your craziest idea and know you have the support of your bosses — I realized right then and there that this was it." Fiorini's first item of business at Element has been to reshape people's perception of the bar from an elegant, special occasion dress-up affair to a regular, everyday bar that just happens to be really beautiful. He wants prospective guests to know that they can dress up and experience all the trappings of an upscale experience, or they can come in jeans, order a Michelob Ultra and play corn hole (the game components are now on the patio). That hospitality-first vibe fits right in with what he's been taught by Steele, Saputo and his mentors in Albany — and what inspires him to be in the business. "I think the stars are aligning and that it's the right time for me to take on this challenge," Fiorini says. "I finally feel like I have an opportunity to make my mark on St. Louis." Fiorini took a break from the bar to share his thoughts about rediscovering the St. Louis food-and-beverage scene, the doughnut lady who will always have his heart, and why putting raspberry sauce on mozzarella sticks is actually a good idea. I thought long and hard and, honestly, I’ve got nothing. For better or worse, I wear my heart on my sleeve and am a pretty open book. Grabbing a coffee from Peggy, the sweet lady who works at World’s Fair Donuts. In fact, I’m walking out the door to do just that. I’ve only been back for six months, but I would say frozen drinks straight out of a slushy machine. My hope is that, via this approachable way of delivering a drink, we will see more and more people being introduced to and drinking different cocktails. What is one thing missing or that you’d like to see in the local food and beverage scene? Mozzarella sticks and Melba sauce. I’m looking at my chef, Tudor [Seserman], and chef Tom [Futrell] from Polite Society. Peggy from World’s Fair Donuts. Can I just say the staff at Parlor? I have a feeling they’re going to be doing big things in the coming years. Exciting. I feel like I picked a great time to move back and really be a part of it. From what Tony, Ben and Juana are doing at the Benevolent King to Tim Wiggins and Yellowbelly and so on, St. Louis has some fun things going on. Playing music full-time. Anybody looking for a part-time drummer? A few games of pool at Parlor followed by shenanigans at Ready Room. Buffalo-chicken roll from QT. On a hotdog bun. Piled with crispy onions and glazed with their “gourmet” ranch. A full slab rib combo from Bogart's with tri tip, beans and chips accompanied by a Four Roses “Al Young” old fashioned.